On November 30, 2017, a new technological machine for cutting of metal sheets was put into operation. 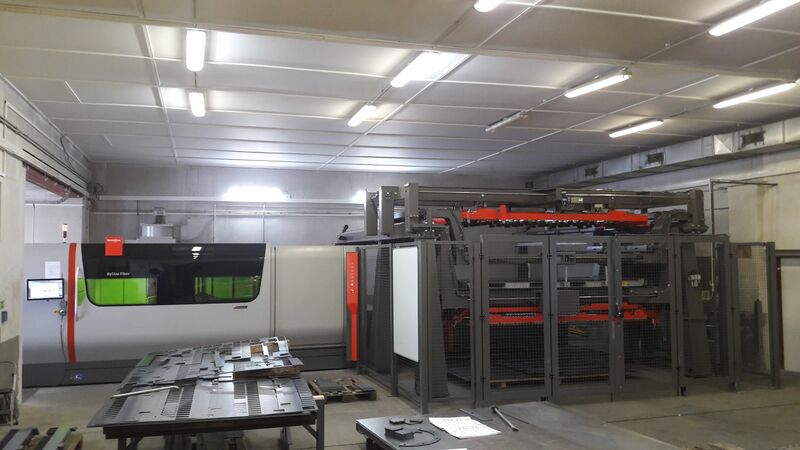 For the new technology it was necessary to extend the existing plasma cutting hall by an additional 3.8 m.
The original plasma firing machine was replaced by new ByStar Fiber 6 kilowatt laser cutting machine from Bystronic for cuting of metal sheets up to the size of 3000x1500mm. For to increase productivity of cuting, laser has been equiped with the state-of-the-art automation ByTrans Cross 3015 to enable automatic sheet metal inserting, picking and sorting of cuted metal parts. Laser burning greatly shifts our manufacturing capabilities and optimizes logistics processes, including shorter production times. On November 30, 2017, a new technological machine for cutting of metal sheets was put into operation. For the new technology it was necessary to extend the existing plasma cutting hall by an additional 3.8 m.